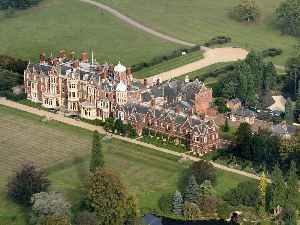 Sandringham House is a country house in the parish of Sandringham, Norfolk, England. It is the private home of Queen Elizabeth II, whose father, George VI, and grandfather, George V, both died there. The house stands in a 20,000-acre (8,100 ha) estate in the Norfolk Coast Area of Outstanding Natural Beauty. The house is listed as Grade II* along with its landscaped gardens, park, and woodlands.